"Up, Up, and Away! Chapter One: Mortal Men"
I promise this isn't becoming a Superman blog... though, if you thought it was, I guess I couldn't blame you. It's been a month of upheaval at Casa Chris, and I've been sorta using this blog as something of a touchstone... using it as a comfortable and familiar place-to-be. In the past, when I needed something familiar, I'd turn to the X-Men. Unfortunately, I wouldn't recognize a single one of them these days... and so instead, we turn to Superman. So basically, I beg your indulgence as I get accustomed to my real-life new digs. Thanks! We open with a pretty straightforward (though flowery) retelling of Superman's origin. I'm guessing this is for the reader, and not part of the story as it begins with a caption of "68 Years Ago". 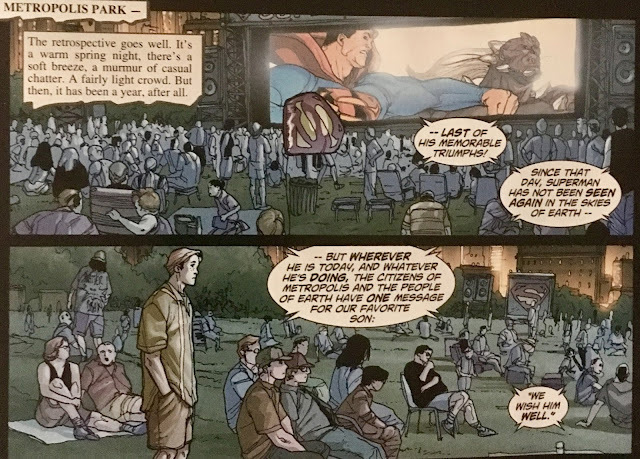 It parlays pretty easily into the Superman Retrospective that is being played at Centennial Park... where the people of Metropolis are thanking the Man of Steel for his service to the city (and world)... and also, commemorating that it's been an entire year since anyone's seen him! Whaa--? It's as though this story is happening... 1 Year Later! Among the viewers are Clark and Lois... and their feelings about the film are pretty mixed. They are approached by Jimmy, who is still deeply saddened that Superman disappeared twelve months earlier. 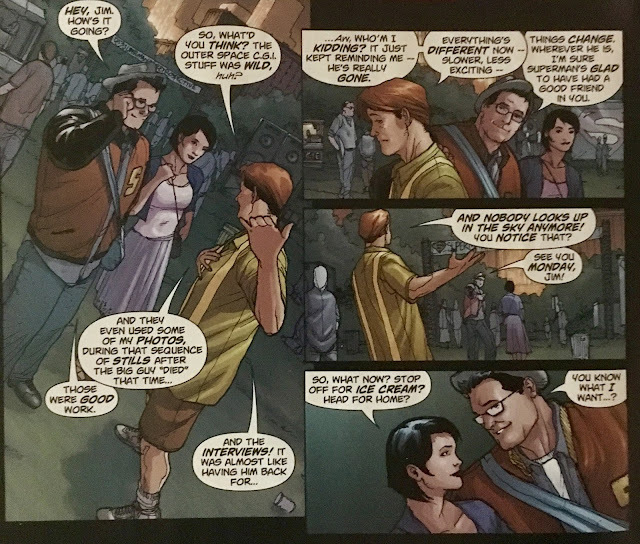 The Kents... well, they kinda blow him off so Clark can go scarf down a soft pretzel. Later, Lex Luthor is released from prison... having been exonerated of all of his crimes. If it feels like we've missed something here... we have! Something, something... Fifty-Two. While Lex was found innocent in a court of law, the jury's decidedly still out in the court of public opinion. During his press conference, he is pelted in the dome with a rock. 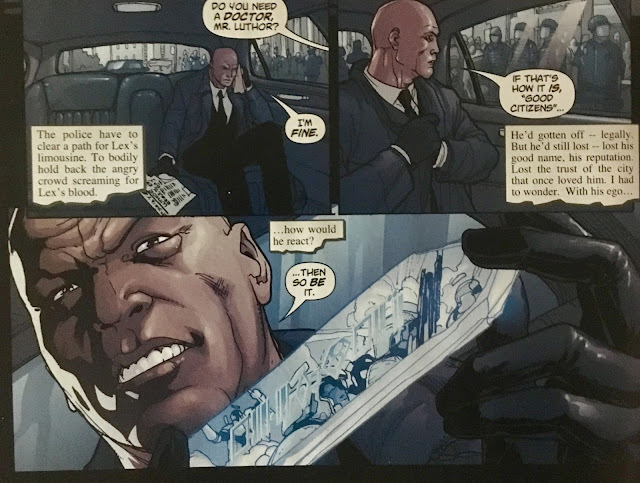 He's rushed into a waiting limousine where he reveals to have in his possession a glass shard, with something etched on it in Kryptonian. The word is... Doomsday. 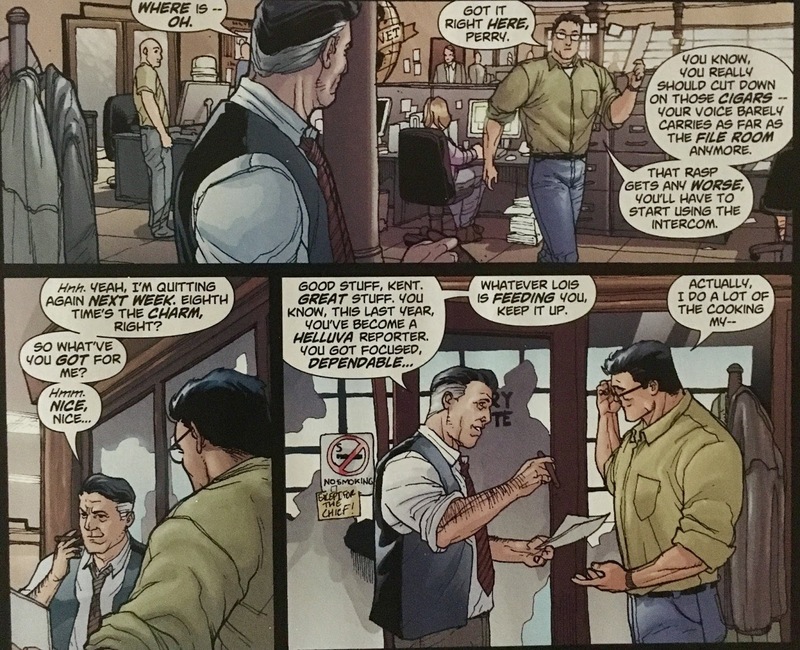 Back at the Daily Planet, Clark delivers his latest Intergang piece to Perry White. Man, Intergang's just won't quit! Feels like Clark's been chasing this story ever since Byrne left! Anyhoo, Perry commends Clark... pointing out how great a reporter he's become, really "upping his game" this past year. Clark heads out, passing a few Fifty-Two-related Daily Planet clippings on his way, until he runs into Lois. 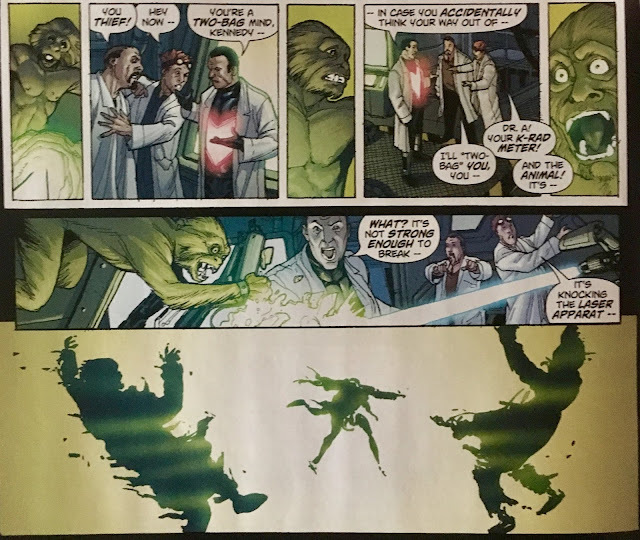 She informs him that down on the Avenue of Tomorrow a fella named K. Russell Abernathy is experimenting with Kryptonite... hoping to use it as a viable energy source. We join Abernathy at his lab... where things ain't going all that well. There's a tremendous explosion. Clark rushes an old woman to safety while looking on... we see a pair of glowing green hands emerge from the wreckage, and soon learn they belong to Abernathy... the Kryptonite Man! As the citizens panic, Clark pulls back to activate his... signal-watch?! 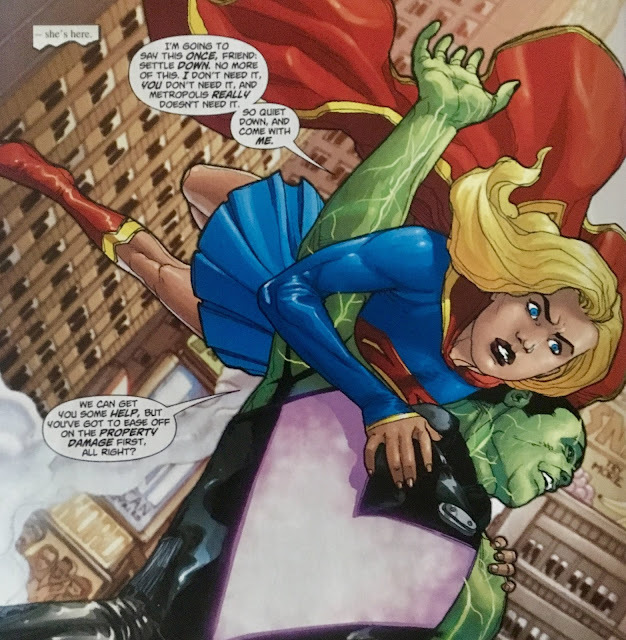 Supergirl and the Kryptonite Man do battle for a bit, with Abernathy actually being able to hurt her with a punch. Kara winds up affixing him to a garbage truck with her heat vision, and flying him away to the S.C.U. Clark notes that she has greatly improved over this last year... remember, she was still quite new to the scene at this point. We wrap up with Clark being dragged into an alley by some nogoodniks. He is then held before the ultimate nogoodnik, Lex Luthor... who really roughs our man up! 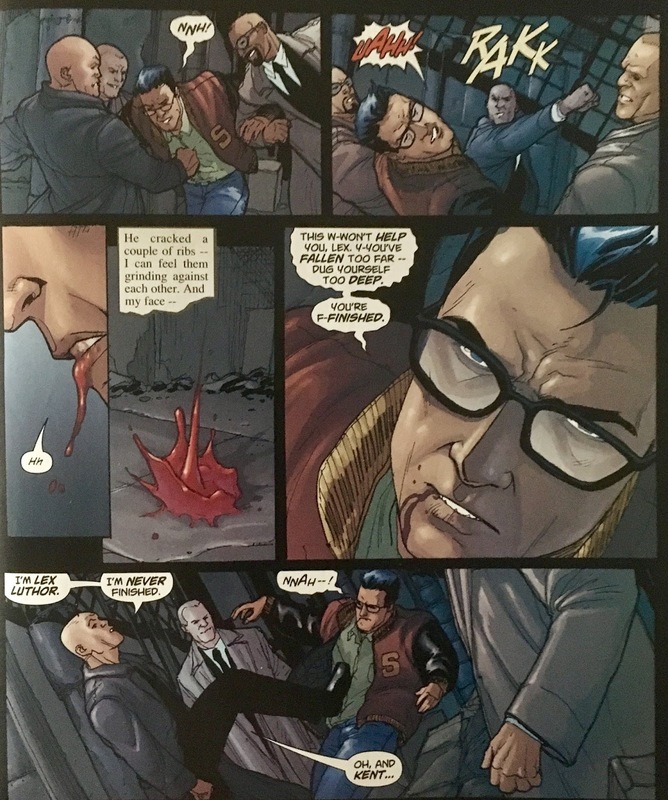 Lex wants Clark to quit writing about him... and punctuates each statement with a punch. It's pretty clear that Clark might just be a bit less than "super" at this point in time. A very interesting issue. 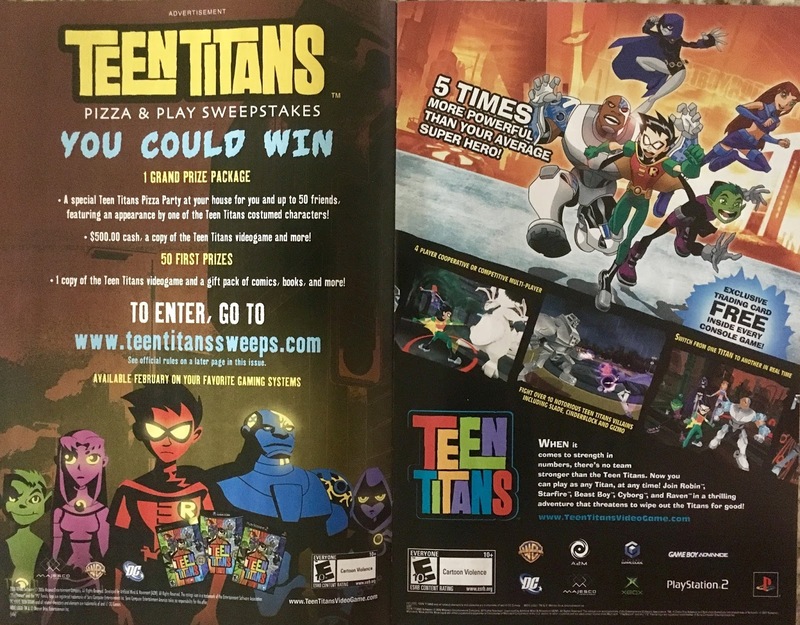 I'm reminded of Marvel's Secret Wars (the first... less horrible one). Let's look at Amazing Spider-Man... in issue #251, Spidey is drawn into Secret Wars. The following issue, he's back... and wearing the black costume. How did that happen? Well, you're going to have to read Secret Wars, silly! We get plenty of breadcrumbs here... but if you want the actual loaf, you're going to have to check out the weekly 52 maxi-series. It's definitely an interesting approach to rejoining a universe "already in progress". 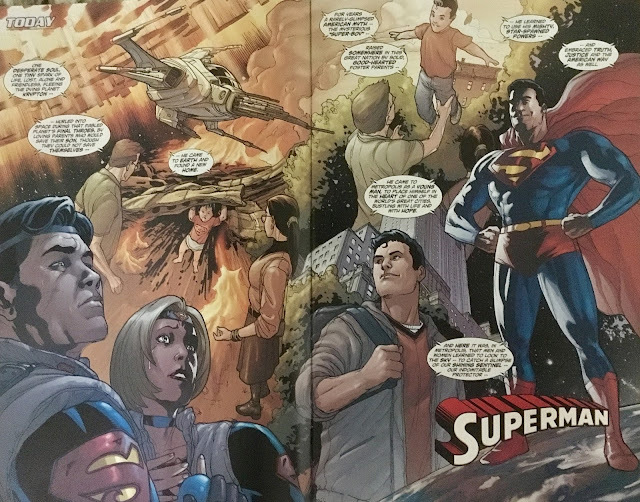 So much was up in the air following Infinite Crisis, that I couldn't say with any certainty that even DC Editorial knew what went where. 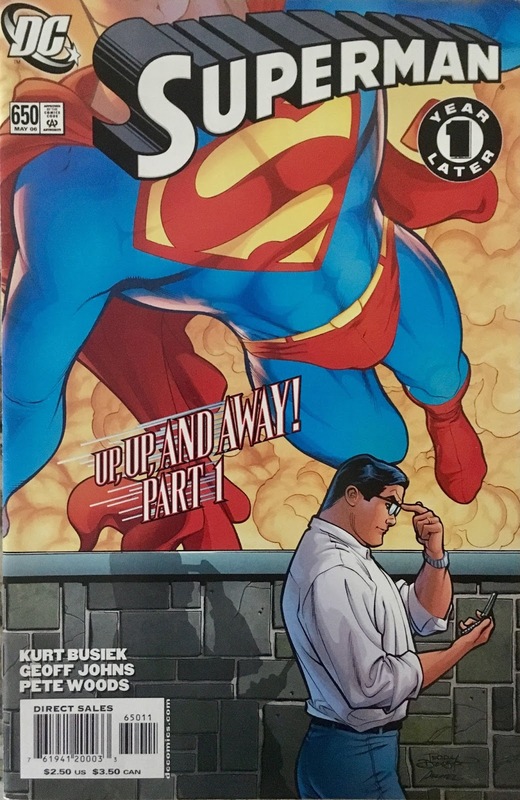 I mean, it wouldn't be until over three years after this issue that Superman: Secret Origin was released. That's three years... thirty-six issues of each Superman book, where we didn't know what his origin was! Let's talk Clark. It's not until the final page that we see that, yes, he's depowered. For all we knew, he was just taking a break from suiting up. In his new, more human, lifestyle... he's enjoying some of the more mundane things... a soft pretzel smothered in that horrendous glop we call mustard, upping his game at the office, just being a normal dude. It's strange to say... but, I find him to be far more aloof as a "normal dude" than I ever viewed him as Superman. We see him dismiss Jimmy Olsen a couple of times in this issue alone. That might just mean one needs to be Superman to put up with the goofball, but I still didn't really dig it. There was just a feeling of detachment here. Hard to put my finger on it. 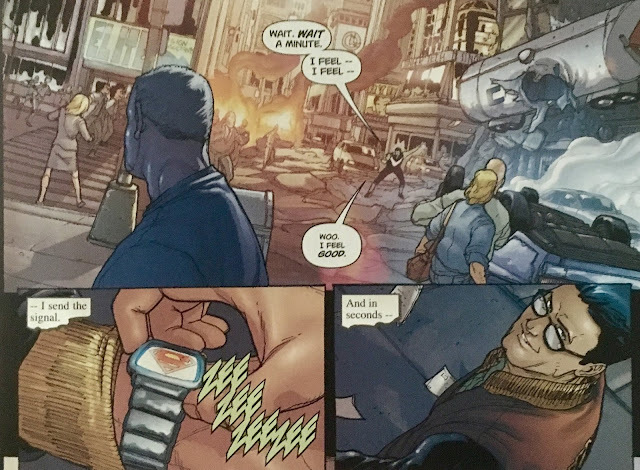 Speaking of "putting a finger on it", I thought the bit with Clark having a signal watch was pretty inspired. 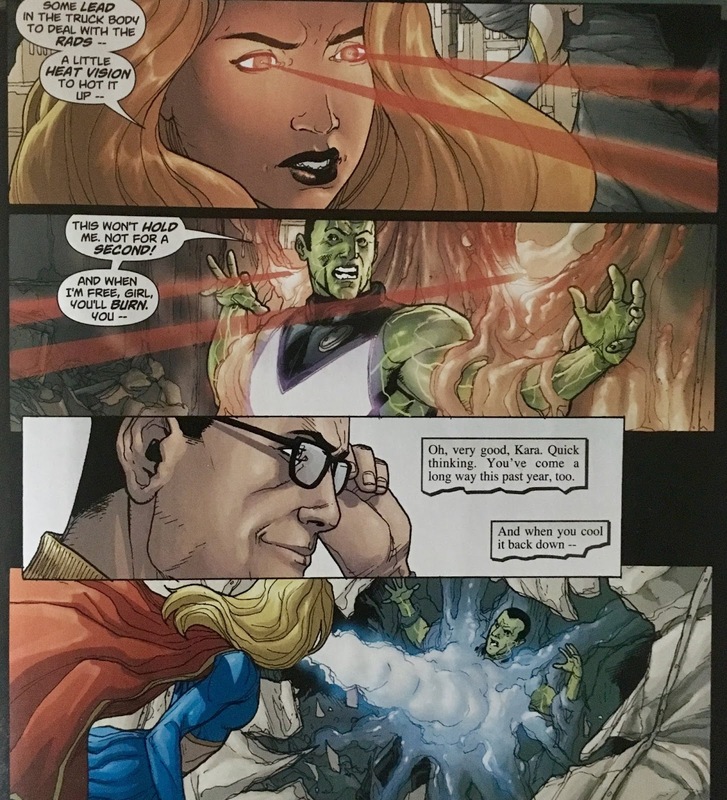 Supergirl was still something of a question mark at this point, having only appeared a little while before Infinite Crisis... so it was cool seeing her come into her own here. 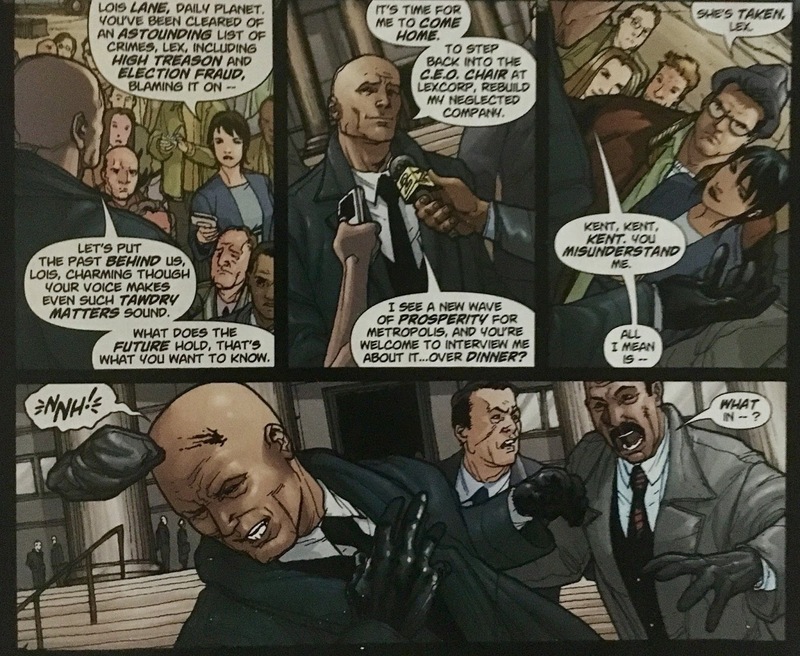 Lex's exoneration is pretty weird. We recently did a bit of research on Steel for Cosmic Treadmill, and recalled that during 52, John Henry found the corpse of an alternate-Earth Lex Luthor... which somehow cleared our Lex of all his crimes. I guess it's one'a them "it's comics" sort of explanations. Though, to be fair... I haven't read 52 in quite some time, I'd assume/hope there's far more to it than that. Overall, really good issue! It keeps things nebulous, while not frustratingly so... and begins laying the foundation for the next evolution of post-(both)Crises Superman. Worth checking out... I'd guess that at least some of this might still be in continuity now! Hard to believe this issue is nearly 12 years old! 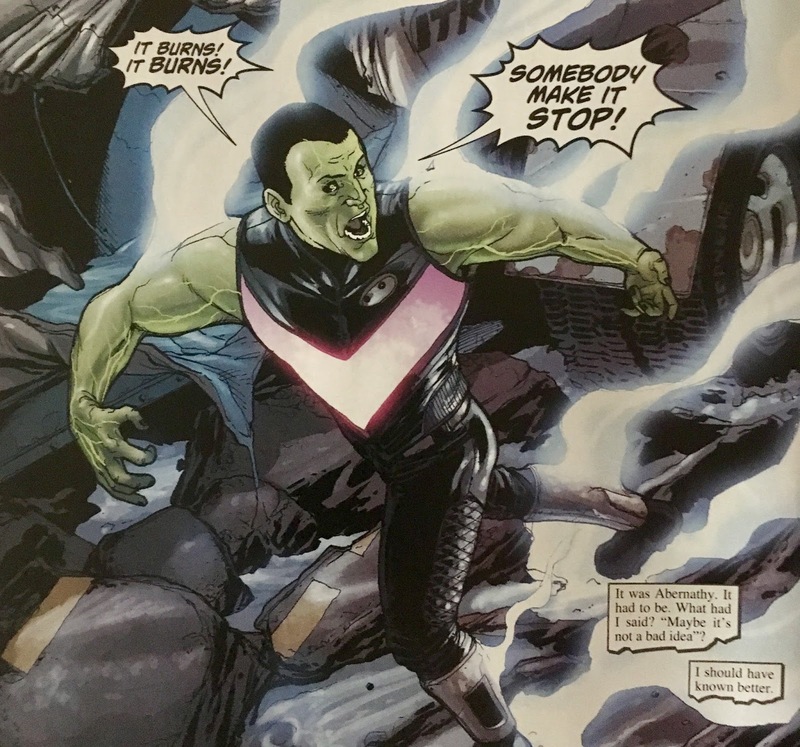 I'd forgotten the aloofness...though looking back, I'd say that could be more a sign of the shift back to the overpowered, Kryptonian-first take on the character over the Clark-first Byrne et. al. take.